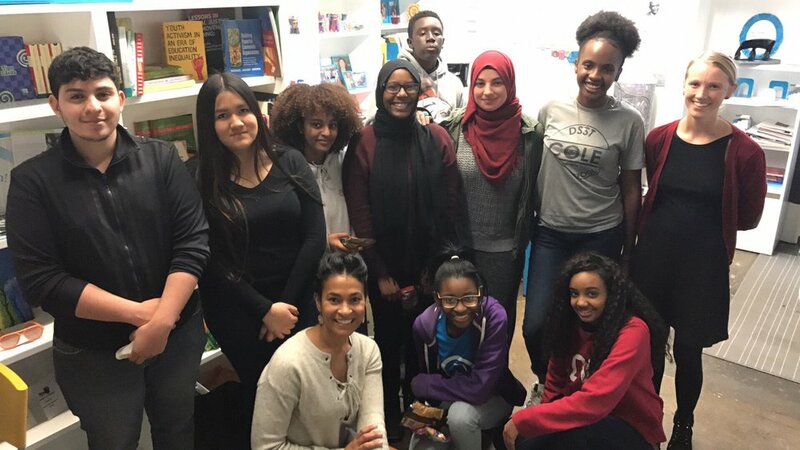 The Block Captain program allows recruited students to serve as teen activists and social change agents. Satellite teams will represent East, Manual, DSST-Cole, and Bruce Randolph High Schools. Students will be provided real world opportunities that enable them to challenge issues focused on Environmental, Health, Economic/ Housing, and Education Justice within the Globeville, Elyria, Swansea (GES) neighborhoods. Block Captains will focus on the development of improving communication channels, involvement, and resource sharing through campaigns that will inform while motivating resident mobilization. Block Captains will amplify community and youth voice through youth-adult partnerships participating in activities/events. "Nothing About Us, Without Us..."
In 2006, the closure of Manual High School- a traditionally underserved, high minority, high free/reduced lunch, inner city public school in Denver - served as a catalyst for the creation of Project VOYCE (Voices of Youth Changing Education). While the closure and school redesign efforts had good intentions of involving the community input, the youth recommendations were left out of the final reports and ultimate redesign. Determined to ensure that the insights would be heard and utilized in future school reform efforts, two former Manual students, a former teacher and the founder of YouthBiz, launched Project VOYCE. Project VOYCE is a non-profit organization that provides leadership programs for students in the underprivileged sectors of Denver and teaches them how to combat challenges in their communities. VOYCE stands for “Voices of Youth Changing Education”, which provides an environment where students can discuss the problems facing their community, specifically issues regarding their educational systems and communities, and how they can change them. Project VOYCE works to provide a separate arena for students to discuss and breakdown societal barriers. They “restore human agency” in young people by providing tools to develop, employ, and organize. Project VOYCE encourages students to engage in civic problems and be critical of education which becomes instrumental in creating societal change within the disadvantaged communities that become stuck in the cycle of poverty. Project VOYCE increases the leadership potential for their mentees in hopes that they will soon be in decision-making roles. This way, representation is provided across social structures and socioeconomic lines. Provide economic opportunities to underserved youth that offers career paths and strong earning potential, and creates opportunities to affect systemic change and provides support and flexibility to advance education. Increase civic engagement and civic health in underserved communities. Highlight education as a tool for increasing lifetime earning potential and disrupting cycles of poverty. Create an alternate context for youth to develop the skills and knowledge necessary to dismantle the barriers embedded in education, employment, housing. Restore human agency as early in the lifeline as possible through youth development, youth employment, and youth organizing. Highlight education and civic engagement as the most critical levers to disrupting the cycle of poverty and disadvantage. Enhance leadership potential for representation in decision-making roles across social structures and economic sectors .